Dandelion greens are right there with spinach and kale as my favorite smoothie green. They offer an array of health benefits and blend quite well. What a lot of people consider a pesky lawn weed, dandelion has actually been used for centuries for medicinal purposes. Dandelion greens are rich in alkaloids (plant medicine), which give them their medicinal properties and bitterness. Let’s delve into the various health benefits of dandelion greens before a nutritious green smoothie recipe you’re going to love. Calcium and Iron: Two vital minerals that are abundantly present in dandelion greens. Digestion: Promote digestion (good source of dietary fiber) and aid the growth of healthy bacteria in your gut. Detoxification: Excellent for liver detoxification, and help cleanse and heal the gallbladder. Vitamins: High in vitamins A, B complex, C and D.
Minerals: Besides being rich in calcium and iron, dandelion greens also contain copper, manganese, phosphorus, potassium, and magnesium. Protein: Dandelion greens are 14% protein and contain more protein per serving than spinach. For experiencing all the wonderful benefits of green smoothies from increased energy to weight loss, dandelion greens are a great option to green your smoothie. 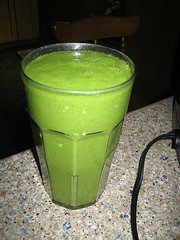 Rotating the greens you use in your smoothies every couple of weeks is recommended. Because dandelion greens tend to be pretty bitter, start out with a small amount and work your way up. Place all the ingredients into your high-speed blender and blend for about 30-45 seconds or until desired consistency is reached. As always, comments are welcomed and encouraged below. Cheers! Thanks. I was ready to weedeat the dandelions but they have nice big leaves so I thought I would try a smoothie first. Great to hear you like it, Sarah!